“Welcome to the world of President Rand Paul,” blared the headline at TheWashington Post. In the piece that followed, columnist Josh Rogin took President Donald Trump to task for reportedly listening to the Kentucky senator too much. This is consistent with what Trump promised during the election. It’s consistent with what Rand Paul has advocated during his time in Congress. It’s also what Barack Obama once promised. Obama campaigned on resisting Washington’s longstanding predilection to rush into war, particularly in Iraq, and promised to challenge the status quo. But a main difference between Obama and Trump, or at least Trump’s actions this month, is that Obama was never able to fully break from Washington foreign policy consensus, which some progressives lamented. “Trump’s Iraq trip moved U.S. foreign policy one big step in Paul’s direction,” Rogin writes. And why wouldn’t the president move foreign policy in Paul’s direction, considering it is also the direction Trump himself had promised? Trump reportedly seeks counsel from Paul because Paul is one of the few in Congress who agrees with him. This isn’t crazy or reckless or subterfuge or whatever other barbs foreign policy elites will continue to come up with. Again, it’s consistent. Right now, the president of the United States is actually, finally, challenging Washington’s conventional foreign policy thinking. Expect the establishment to give him no quarter. And expect Donald Trump to find every ally—even if it’s just one—that he can get. Every president deserves good advisors. All the better if President Trump has one who is effective and peace-loving. The fact that Josh Rogin can write that “most Americans—favor a robust U.S. foreign policy” and not have any push back from either the political class or the grassroots speaks volumes. However much the neocons and neolibs are responsible for the humanitarian disaster in the Middle East, it is also true that ALL Americans have enabled their leaders to get away with murder…just by their silence. It’s not silence the American citizens are at fault for, it’s what Paul Craig Roberts calls insouciance. They don’t care. Well, 2/3rds don’t. They will only wake up when the stuff hits the fan…too late. Bardak and Michael Obama, a lovely couple but proof that a bit of Black Blood does not mean you are not a Zionist and a total incompetent. The reason the pundits squirm is that they know full well that the people agree with Trump’s move to pull troops out of Syria and Afghanistan; that this move will prevent their agenda and leave them nothing to promise voters in 2020. All of which increases the chance for a Trump second term. So how could that not be bad for “national security” alias their privileges and money? I supported Paul wholeheartedly until he worshiped a wall and wore a beanie. That changed everything. I still think he has the best foreign policy, but I question who even HE was working for when he went to Israel. Rogin is a dual citizen and should be removed to his first nation of choice. Rand Paul offers sane, realistic and pragmatic advice. 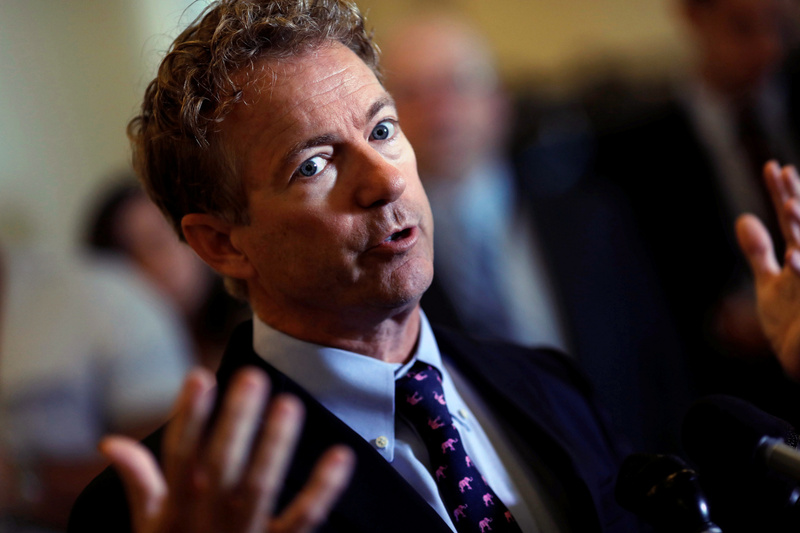 Trump could do much worse than trust what Rand Paul opines. Rand Paul has courage, heart and integrity. He realizes that the majority of American people are sick and tired of endless war, endless costs of war, endless injuries of war. I’m glad Pres. Trump is finally listening to his advice and will continue to do so. I would say that if anything, the president is getting more accurate (honest) information from Rand Paul than he ever received from Mattis, Pompeo, and Bolton.